We are very appreciative of his work in this regard and the import of his retirement message, which states that every Tibetan in exile has the right to participate in free and fair elections of officials entrusted not only with the duty of governance in exile but also charged with the higher responsibility of working for a better future for the long-suffering nation of Tibet. In particular we believe that every Tibetan has the right to hold and express their view as to the future of Tibet. 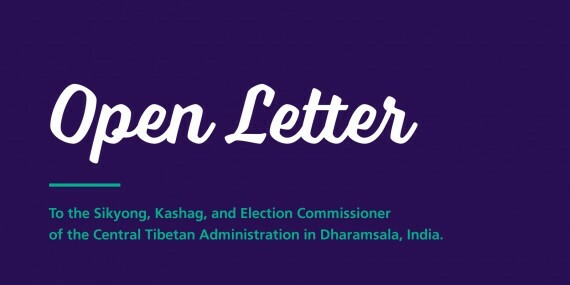 The Tibetan Election Commission has recently issued rules that constrain the right to free speech and association of organizations and individuals during the upcoming exile Tibetan elections. These include a rule that, with one exception, no independent organization or individual is allowed to carry out any announcement or spend funds on campaign activities. These restrictions are inconsistent with recognized international human rights, which are incorporated into the Tibetan Charter (the Tibetan government-in-exile’s constitution). An arbitrary list of organizations that are exempted from the rules was created by the Kashag; this list includes at least one organization openly supporting the current incumbents, which gives a significant electoral advantage to such incumbents. Neither the Election Commission nor the Kashag has provided any criteria or procedures for approving additional organizations to be exempted from these rules and this is in spite of multiple requests by at least one organization supporting a non-incumbent candidate wishing to be thus recognized or exempted. Moreover, in setting up a system with a double standard, in which certain organizations enjoy full free speech rights and the rest do not, the Election Commission has politicized the process, since Kashag approval is required for exemption from these restrictions, yet the head of the Kashag is seeking re-election. Clearly, no legitimate democratic system can allow one candidate in an election to decide which groups get to speak or spend freely in that election. The Election Commission’s rules contain vague prohibitions that provide opportunity for arbitrary interpretation and retroactive enforcement. For example, these rules prohibit any person from making any “character assassination” or creating “conditions that would lead to conflicts within the society through sowing dissension”, without defining such terms or establishing any due process adjudication. Violations could result in all votes for a particular candidate benefitting from such activities (whether or not the candidate even instigated these actions) being declared null and void, at the sole discretion of the Election Commission. Moreover, the exceedingly vague and subjective wording of this rule risks creating a chilling effect on democratic discourse and dissent. So far, the Election Commission has received at least one complaint from a non-incumbent Sikyong candidate alleging that an incumbent candidate is violating the Election Commission’s prohibitions on using official platforms for campaign purposes. The Election Commission’s reply – that it does not have the resources to police all noncompliance – raises the troubling possibility of selective enforcement. Finally and most critically, officials of the Election Commission, Parliament, and Kashag, who are responsible for the above policies and procedures, are either officials whose seats of power are at stake in the upcoming election, or are appointed by those officials. There has been no public consultation or open rule-making process prior to the promulgation of these rules, nor is there an independent judicial check to ensure the rules’ compliance with international human rights norms or to ensure fair implementation. The problems that may arise from such undemocratic practices are many and serious. By providing means for incumbents to silence opponents before the polls open and to arbitrarily and retroactively make decisions on key rules, the Central Tibetan Administration risks becoming regarded by its people, the host nation of India, its international support base, and the international community, as an undemocratic body unworthy of trust. Even more seriously, such practices leave open the possibility of CTA posts being taken by people who become unaccountable to a free and fair popular vote and therefore able to act without the approval – or even against the will – of the Tibetan people. The continuing support for the Tibetan cause by ourselves and many others worldwide is, partly but significantly, based on the Central Tibetan Administration honoring both the spirit and practice of His Holiness’s efforts to implement true democracy in the Tibetan polity, signified by an irreproachable public trust in free, fair, non-partisan election processes. We urge you to make early (i.e. before the Preliminary election) positive responses to all our concerns outlined above. His Holiness and the CTA have, on many occasions, requested all the world to help Tibet, and expressed their appreciation for the assistance given by Tibet Supporters and Tibet Support Groups around the world – we who answered the call. That continuing support should not be wholly taken for granted.